In the 70 years since Stanley Burroughs developed the Master Cleanse, thousands of people have used his simple technique to detoxify. Essentially, the Master Cleanse is a form of juice and tea fast with a daily “salt-water flush.” Instead of food, you consume a mixture of fresh-squeezed organic lemon juice, organic cayenne pepper, and pure, organic maple syrup. 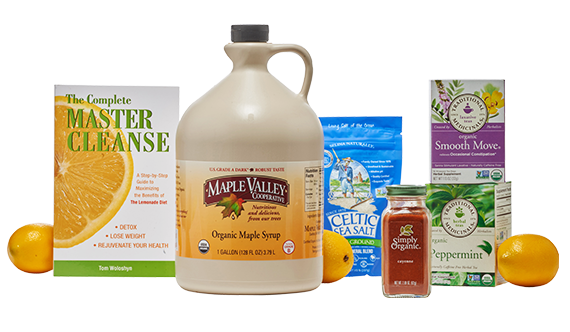 With a Maple Valley Master Cleanse Kit, you provide the fresh lemons and purified/filtered water and we provide all the rest: organic maple syrup, organic cayenne pepper, sea salt and tea, along with the Master Cleanse guidebook of your choice. Click here to start your Detox Program with a Master Cleanse Kit today! Drink 6 to 12 glasses per day. Every time you get hungry, drink another lemonade! Don’t leave home without your lemonade! If you go out for the day, pre-make your lemonade and take it with you, or take your ingredients and make it fresh at work if you can. Make sure you take enough. Rest when you’re tired and your body says rest. Cleanse with a group – it’s fun, and you’ve got support!